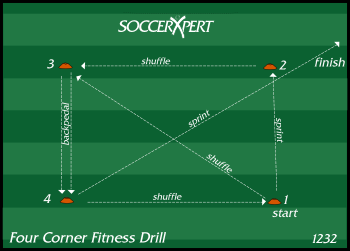 The Four-Corner Fitness Drill is a great soccer fitness drill designed to improve lateral speed and agility required in soccer. Setup: Set four cones in a grid that is 15X15 yards. Instructions: Start at cone 1 and sprint to cone 2. Shuffle to cone 3. Backpedal to cone 4. Shuffle back to cone 1. Shuffle across the grid to cone 3. Backpedal to cone 4. Then sprint past cone 2. Repeat 4 to 5 times with 1 to 2 minute rest between reps. Coaching Points: Low center of gravity when moving laterally and backwards. Focus on quick starts, fast change of direction and speed.